make the trip from Alabama to Texas. in a teeny Texas town. 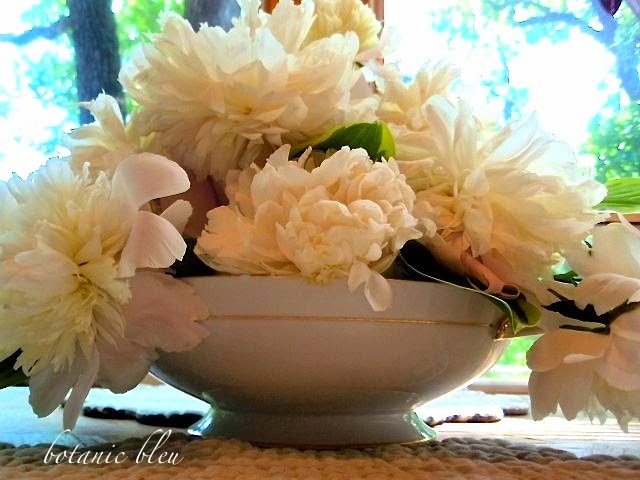 color in the fragrant creamy white peonies. the breakfast chairs with its new upholstery. 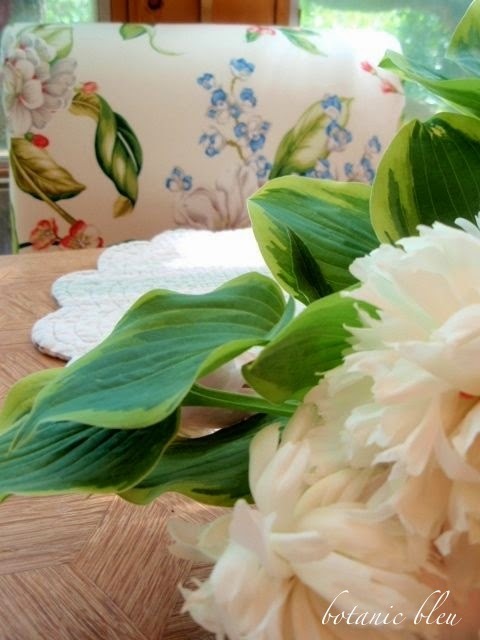 Are those large white flowers in the upholstery peonies? both the back and seat of the chair. Are there too many stamen for the upholstery flowers to be peonies? I like the flowers in the new upholstery. 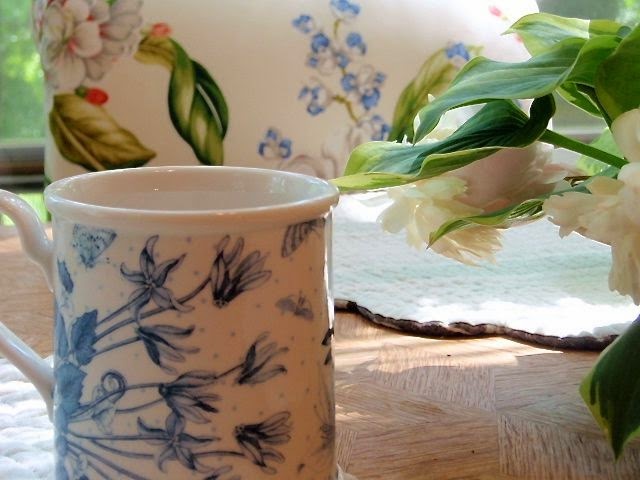 With the white background, the floral pattern is light and airy. The peony arrangement goes well with the chairs. goes with blue and white china? The green leaves in the new upholstery also go well with the hosta leaves. just waiting their turn to be in the spotlight. thanks to all my new followers. I continue to be amazed and grateful. worthy of being in national media articles. But then, isn't a blog a national media article? Or rather, an international media article? 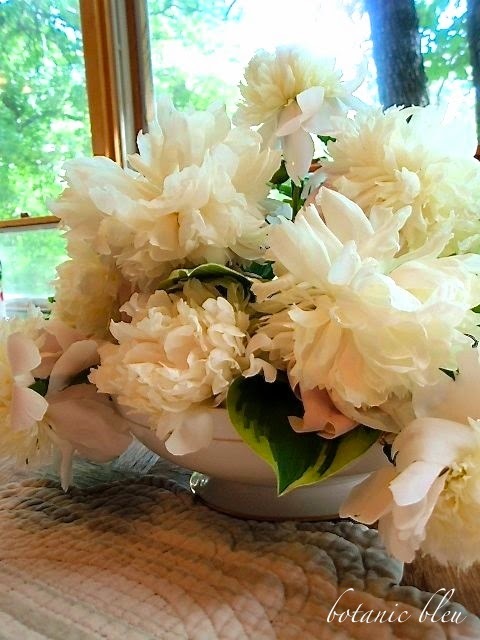 A gorgeous big bouquet of peonies that must smell wonderful. 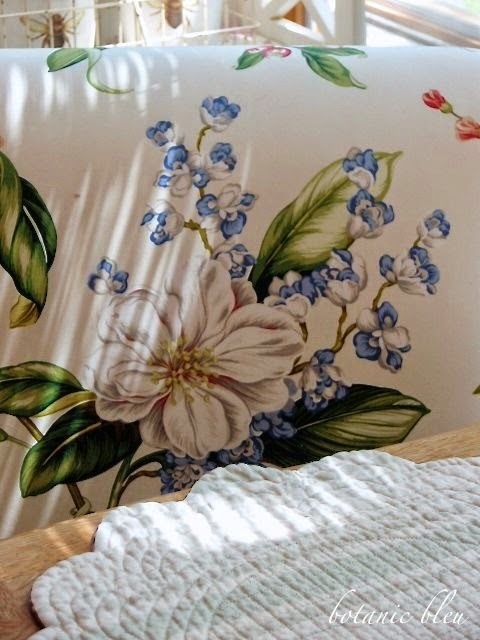 I'm not sure if the flowers on the fabric are peonies but I sure do like it. I don't know which I love more, Judith ~ the peonies or the new upholstery. Together, they are stunning! Beautiful... both the arrangement and the new upholstery. Both the flowers and the upholstery are wonderful! They certainly compliment each other! I love the addition of the hostas. We had a nice stand of hosta plants in AL for about two days before the deer would dine on them! How I loved that shady corner of the lawn - pre deer that is! 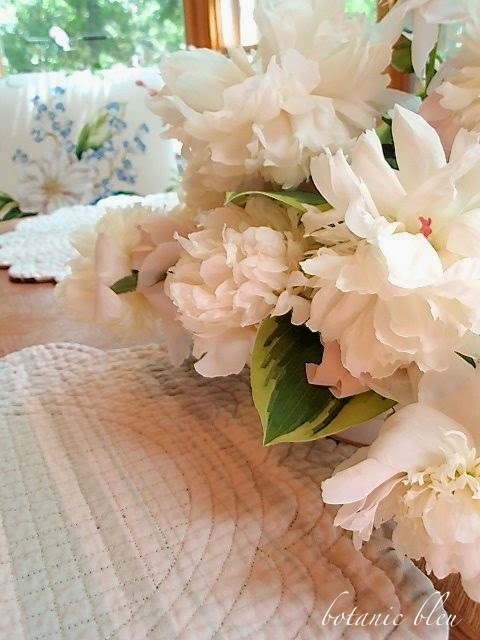 What a gorgeous bouquet of peonies. I recently brought in hosta leaves for a bouquet and I was so pleased with their longevity in a vase. 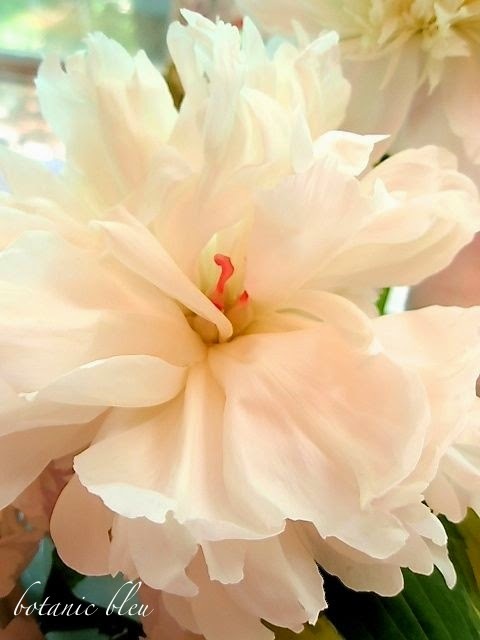 The white floiwers on your upholstery are more like tree peonies, which do have many stamens. But magnolias also came to mind. I hope you have a great day. Beautiful bouquet! I love, love your breakfast chairs. Gorgeous fabric! I floated through this post! I felt like I was dancing! I was just lifting...just...as I found your words..."light and airy"! 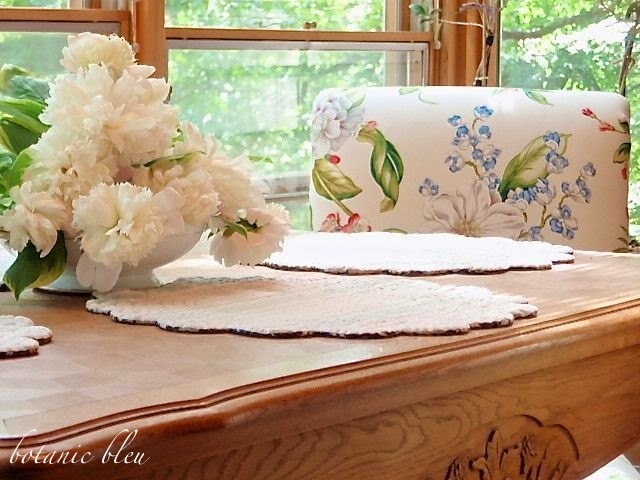 Your upholsterer did a fabulous job with fabric placement. ...and excellent, choice of fabric, my friend! perhaps. I should "just pay attention". no. ...not when I am distracted by your pretty images and story! 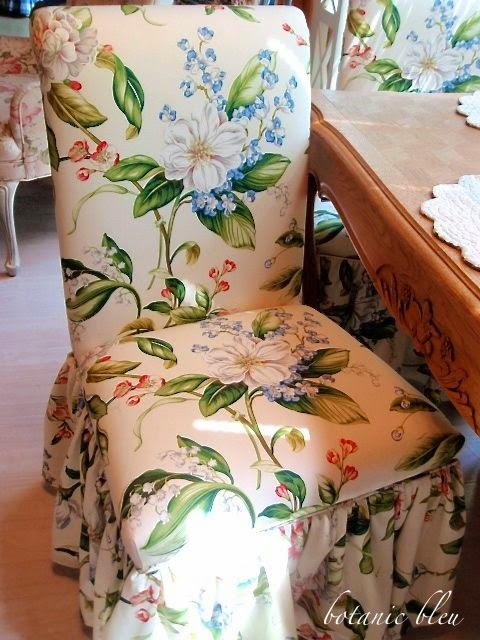 Oh goodness, you could not have picked a more perfect fabric for the chairs. It is amazing and so "just right" for your home. 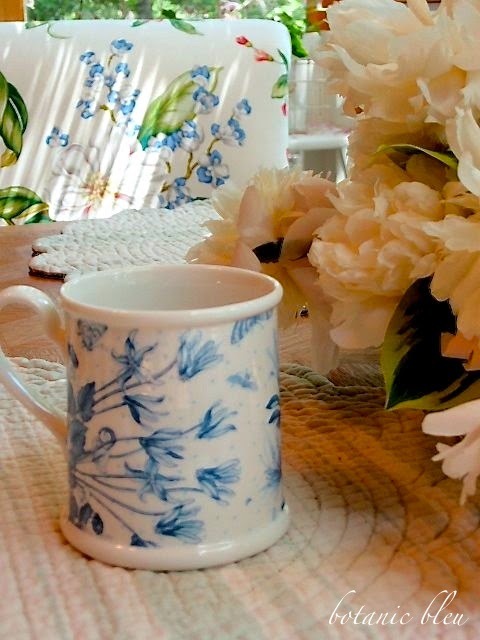 You won't have fresh flowers on the table year 'round, but the chairs will be ever blooming :) I share your love for blue and white and you are so right~ blue and white china blends beautifully! What a beautiful arrangement. I never would have thought to add hosta! 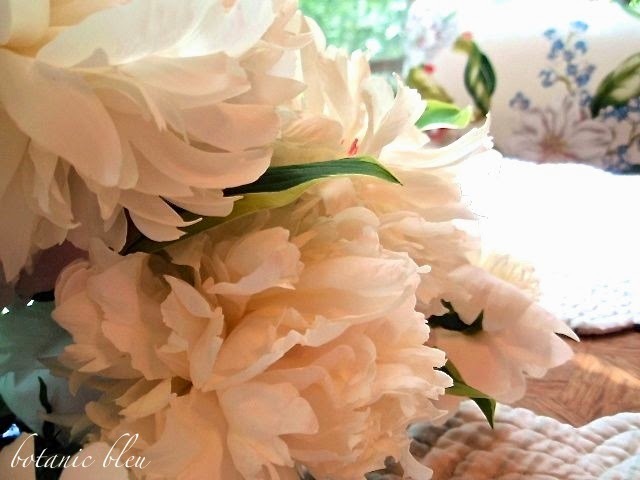 Peonies are also a favorite of mine. I'm thinking the flower in your new upholstery may be a magnolia! Either way, the fabric is gorgeous. This is my first visit to your blog. 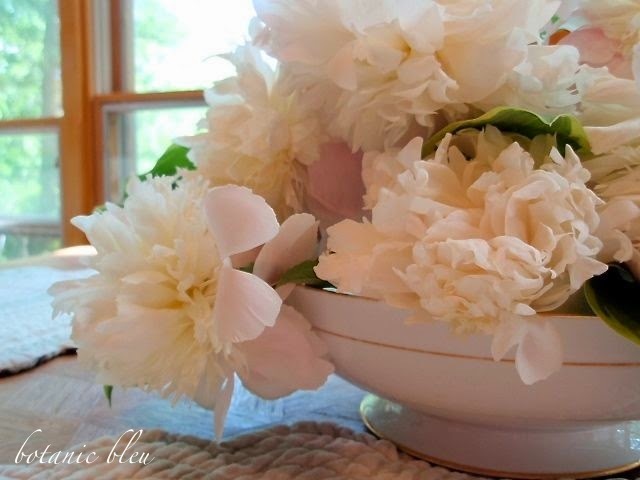 Peonies are my favorite flowers and that is saying a lot since I love all flowers. Love the fabric on your chairs! It is just perfect! Your chairs look beautiful. I love the fabric. The fabric on your chairs is fabulous. It reminds me of chintz. Beautiful flowers and beautiful fabric! Your chairs are beautiful, and so is your whole table set up. Thank you for sharing. I love that fabric. Just gorgeous. Not sure what that flower is since I am not good at naming flowers, but it isn't a magnolia like one commenter said. Leaves aren't correct for a magnolia.